Before he was a world class photographer, Edward Steichen was an artist, don’t the two go hand in hand? A wealthy New Yorker asked Steichen to paint some panels for the foyer of a townhome he was building. The New Yorker came on hard times and could not pay Steichen, so he rolled up his paintings and put them away. 110 years later they were discovered and purchased by the Dallas Museum of Art, where they were carefully restored. They are lovely Art Nouveau treasures. A favorite Steichen quote of mine, “photography is a major force in explaining man to man”. This is my offering for the purple Saturday rainbow. What a masterpiece, stunning painting and colours. 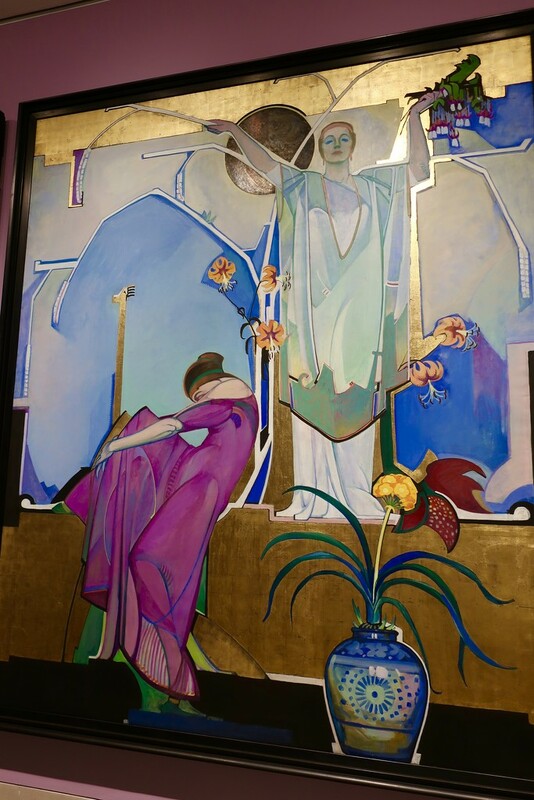 Wonderful Art Nouveau painting. Fav. Lovely shot and beautiful artwork. That's such an interesting story behind this artwork - and a lovely purple. Oh Lou Ann this is such a wonderful artwork and an interesting story too. fav. Lovely piece. Loved reading the story.I actually painted before I got my first DSLR camera. So lovely and wonderful narrative. How very beautiful & what a story. He certainly had a very creative mind! @ludwigsdiana @beryl @gijsje @ziggy77 @lynnz @mittens @milaniet @onewing @sugarmuser @radiogirl @grammyn @365karly1 @bkbinthecity @happysnaps @gigiflower Thank you so much for your wonderful comments and faves. As I remember, this was the last panel he painted and when the funding dried up, he didn’t complete the piece. You can see the white spaces that he had yet to paint. You put this on the Trending Page, thank you! Nice shot. The story reminds me of a notebook/ledger they found of Vincent Van Gogh sketches. A friend who was an inn keeper had give Van Gogh the book to use for his drawing. Van Gogh filled it and had it returned to the but whoever received it thought it was just a ledger and stuck on a shelf where it sat for almost 100 years. Amazing stories! They are very bold colours. Thanks for sharing the story and the image.